This is a bit off-topic, but this event happened the other day outside my studio. I heard an unusual sound, which happened to be several hundred crows making a ruckus outside my studio. One of the few advantages of being self-employed, is that I can peek out my doorway when the mood fancies me. ” In my experience, crows are generally not normal prey for diurnal raptors. At least not in our area here in western WA. 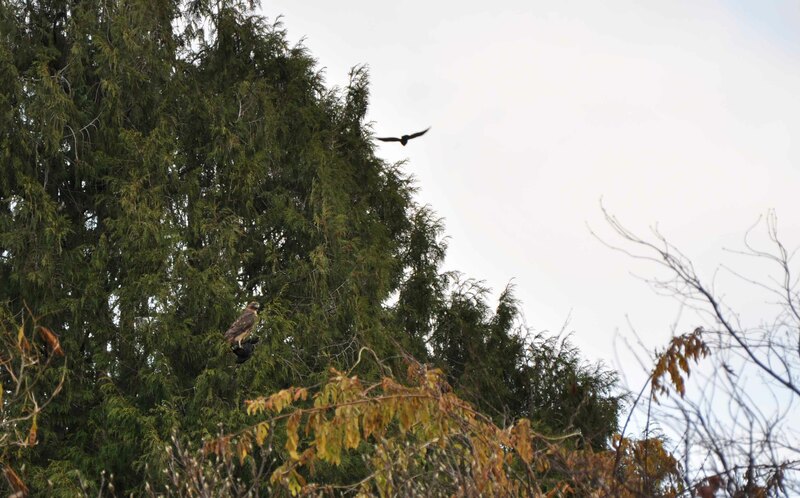 However, it might help to imagine what it is like for these birds of prey in December. Obviously, in winter, it is colder which requires more caloric intake to stay warm. Hawks have to hunt, kill and eat more to survive now than in summertime. The days are shorter, giving them less time each day to procure their food. In contrast, this works to the advantage of the nocturnal owls. Hawks, and especially Bald Eagles, often congregate in areas with a high density of prey to hunt and may experience more competition from other raptors for scarce prey. Once caught, the prey is often pirated by competitors, especially if you are an inexperienced juvenile. Prey species themselves are more experienced and probably in most cases, harder to catch. So things are pretty intense for hawks right now. In fact, those juveniles that can’t meet these demands are dying out there right now. As a result, hawks, and other predators, are unlikely to pass up a chance to take any kind of prey that presents itself. As long as it is not too costly to obtain. After all, protein is protein. Keep in mind that hawks can’t go to Safeway for their food like you. Having said all that, there are specific individual raptors that will specialize on a certain prey species like crows. A falconer will call this process “wedding” the hawk to a particular prey species. I recall Steve Herman telling me about a wild peregrine, I believe at Long Beach, WA (sorry Steve), that specialized in cutting off crows unwise enough to fly out over the ocean. It was a crow specialist. At a peregrine eyrie (nest) in the San Juans, where we banded young, one of the adults was also a crow specialist. When we entered the site, the ledge was littered with a thick mat of plucked crow feathers. Oddly enough, we rarely saw crow remains in other peregrine nests. But this one was filled with them. This particular pair also liked to catch Pigeon Guillemots, one of my favorite birds and one I always thought of as perfect prey for peregrines. But again, we rarely saw them as prey in other peregrine nests for some unknown reason. But there were several in this particular site as evidenced by several little “glowing” red legs. So if you see a hawk of any kind eating a crow, I’d say that is fairly rare.” Bud Anderson, Falcon Research Group. I’ve left the text intact. I thought this was too good not to share with everyone. As many birds struggle during this time of year, it is especially true of the raptors. This entry was posted on Wednesday, December 21st, 2011 at 7:09 pm	and tagged with crow, hawk, raptor and posted in Uncategorized. You can follow any responses to this entry through the RSS 2.0 feed.